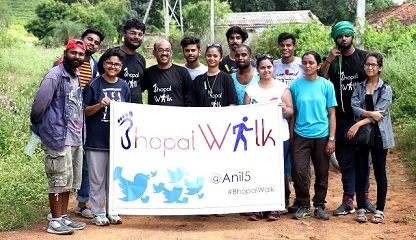 Bhopal: Enthusiasm of a special group of heritage and Bhopal lovers was at its peak on Sunday as the team proceeded to Buddhist site Sonari on Sanchi Road in Raisen district to participate in the 50th BhopalWalk. BhopalWalk is an initiative wherein heritage enthusiast and Bhopal lovers visit a place of interest in or around Bhopal – and live Tweet the highlights of the spot. The initiative, led by heritage and photography enthusiast Anil Gulati, commenced in February 2015 and completed 50th trip on Sunday. Over the last several months, motley group of Bhopal lovers, irrespective of age group, have participated in the special walk that seeks to promote to promote heritage and uniqueness which exists in and around Bhopal. Till now, it has covered sites of rock art, heritage structures, food culture, traditional night life of Bhopal and other unique places like haunted houses. On the eve of 50th walk, an event was organised in Saturday evening to share the experiences of the people who were either part of the walk or those who promoted it on mainstream or social media. On this occasion, Gulati shared that for the time being the BhopalWalk would be halted and then restarted with a new design and structure. The 50th walk was held at Sonari – a Buddhist site with remains of stupas, temples, monasteries dating from 3rd century BC to 12th century AD. The participants walked for about 2km through a green terrain which has lots of butterflies. Locally, the site is also known as 'Saas Bahu ka bitha', Anil Gulati shared. In the 50th walk, in addition to Anil Gulati, Disha Malviya, Sristhi Bhatnagar, Pallavi Singh, Satish Acharya, Yuvraj Puria, Sanskar Singh, Sonam Shrivastava, Ashini Dave, Yash, Jyoti, Varun Namdev, Devesh Gautam, Anmol Patel, Pratik Nim. Krishan Pathak and Mohsin Khan participated. Srishti Bhatnagar said that it was a great way to celebrate the 50th walk while Disha Malviya said she will like to come back again to this place.